Is something in your life shifting? Are you questioning its purpose and hoping that life’s difficulties will end in peace, happiness, and understanding? Then know that you are not alone. When a chain of unexpected events occurred, beginning with the loss of her beloved Chinese Shar Pei, Tia, Nicole Gabriel felt her life was suddenly turned upside down. But as she overcame the hurdles of a career change, divorce, and the loss of many loved ones, she found her thoughts and perspective on life shifting into a new and amazing spiritual and psychic awareness. Now she shares her incredible journey for her readers’ benefit. 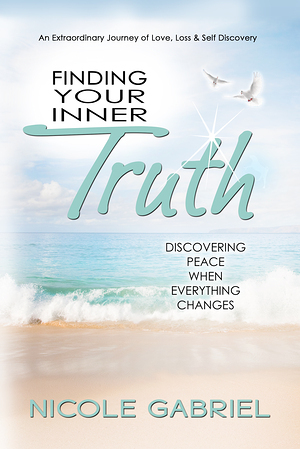 In Finding Your Inner Truth, Nicole takes readers on a wild, mystical, and soulful ride through the most traumatic and magical years of her life to share with her readers the confusion she felt, the questions she asked, and the comforting answers she received. You will be surprised by what is in these pages—prepare yourself for explorations beyond our three-dimensional world, brushes with reincarnation, the foundational principles of shamanism, embracing yoga, engaging in alternative healing, and following the loving guidance of her canine companions. But most of all, you’ll be surprised by what you learn about yourself. Prepare to know that following your heart will always get you where you need to be and lead you toward your inner truth. And when you find it, like Nicole, you’ll realize that everything comes full circle, has a purpose, and turns into love in the end. Let Nicole be your guide on this journey to finding your inner truth!